While the January storms rage outside it is a good time for me to catch up on a little reading. Next to my bedside table is a stack of magazines, books and newspaper articles that would be condemned if it were a building. Their colourful pages vie daily for my attention and rarely get it, but last night, at long last, I managed to tackle the tip of my media mountain. Last weekend’s Saturday Telegraph garden supplement carried two pieces that really piqued my interest. 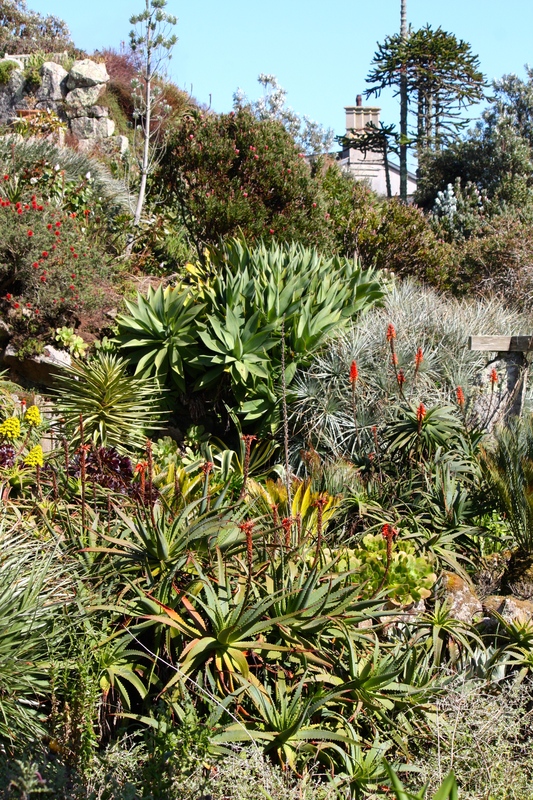 The cover story, penned by Helen Yemm, was an account of her visit to Tresco Abbey Gardens over New Year. Here, as far south and west as one can travel in Britain, the gardening team make an annual count of all the plants in bloom on New Year’s Day. This year’s list stretched to 285 different types (not far short of the record 300), included Senecio grandiflorus, grevillias, clianthus (lobster claw), tibouchina, aloes and many other sub-tropical delights. 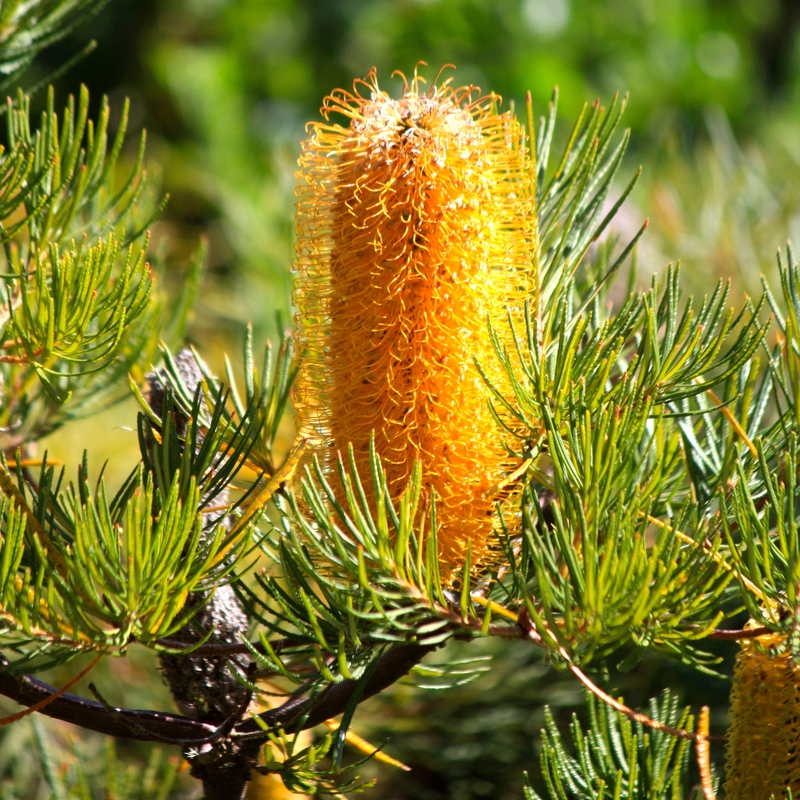 I find it heartening to think that somewhere in the country proteas and banksias are blooming, putting two fingers up at the January gloom. Helen Yemm’s common-sense, gentle and appreciative style always reads well and I finished the article feeling ready to go forth and garden again. Well, maybe not at 11pm, but you get my drift. The lure of Tresco’s unique gardens, surrounded by white sand and clear water, is too much to resist; we hope to get back there for another sojourn this year. Both Him Indoors and I have affirmed Helen’s opinion that, once visited, it’s hard not to fall in love with the Isles of Scilly. The second piece that drew my attention debated the pros and cons of the proposed Garden Bridge across the Thames in London. 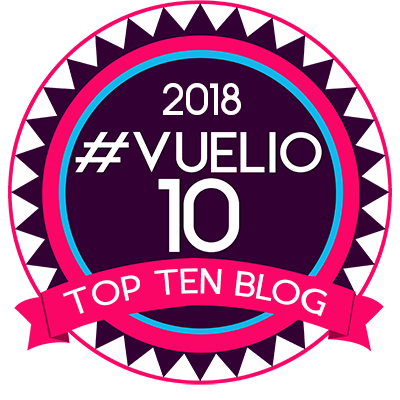 Regular readers of this blog will know I am a fan of the idea, but not everyone shares the same enthusiasm. As I read Mary Keen’s beautifully composed case in favour of the bridge, I wondered at my own lack of grace in writing. She describes the project as ‘poetic and imaginative’, which precisely defines her own Cotswold garden. It’s encouraging that someone so respected in the garden design world is prepared to come out in favour of this contentious project. With every sentence I could hear my own thoughts being articulated in a style that I would aspire to emulate one day. And Mary was convincing too, pointing out the long horticultural history of the Thames’ banks at either end of the span. I’ve confessed my personal bias, but Tim Richardson’s argument against the bridge was no match in style or substance for Mary Keen. Tim seemed to suggest that gardeners at large were not supportive and picked fault with the detail in the plans. Yes, there are valid questions about how the bridge might be irrigated (surely not too demanding given it straddles a major watercourse in a very wet country?) and whether it might occasionally be taken out of public use for corporate events. It’s likely that many questions will remain unanswered until full funding is secured, but do they really render the project unviable or undesirable? I think not. Of all London’s past ‘vanity projects’ (the London Eye, Olympic Park and new London bus were all described as such) only the Emirates ‘Air Line’ has failed to find favour. Even the Millennium Dome, the greatest folly of them all, found a place in our hearts eventually and possesses none of the grace and beauty of Thomas Heatherwick’s design. On one thing both experts agreed: there are probably more worthy uses for the money needed to complete the bridge. This is true, but if all central London’s projects were judged on that basis then I fear most would be found wanting. London is a city that attracts almost 35 million foreign visitors each year, spending £3.56 billion, so surely it deserves public attractions of this quality and ambition? At this point, after about three broadsheet pages, my head hit the pillow. I am duly reminded that reading is stimulating and that I must do more of it. Finding the time is about as easy as crossing the Thames without a bridge. Good luck with the storms. Combined with Graham Norton on the radio, saturday’s Telegraph, coffee and the crossword is our weekend stress buster. I am with you and Mary Keen, I have never been so proud of London, the city looks and feels wonderful, full of positive energy. 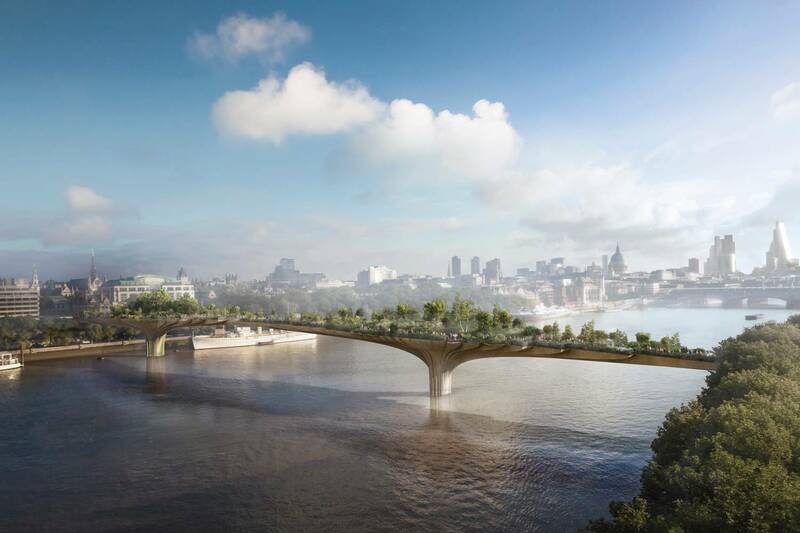 I really hope the proposed Garden Bridge gets the go ahead. My only reservation the projected queuing times, that sounds really grim. Tresco is a magical island.I fell in love with succulents there. It is such a shame there is no longer the helicopter to take you there. 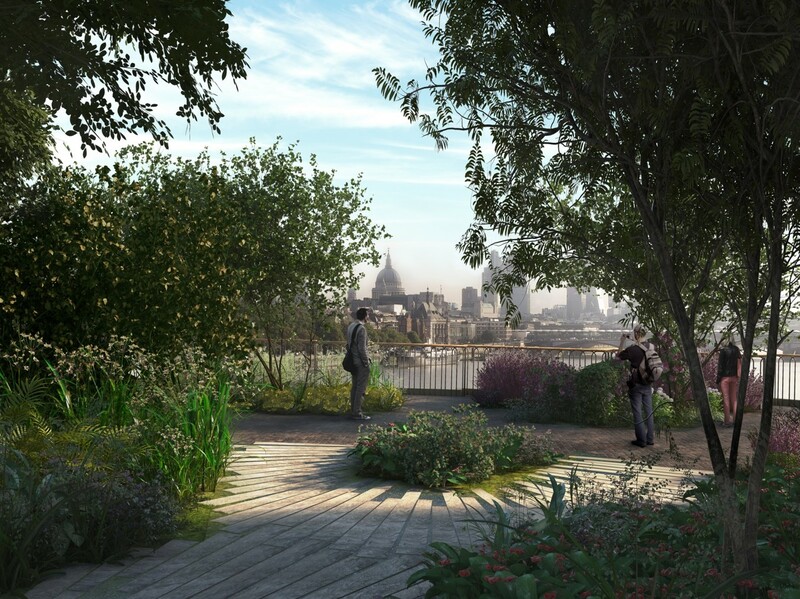 The London garden bridge would be wonderful. Yes, the loss of the helicopter was a tragedy, although I booked it several times and was not able to fly because of fog, wind, rain and once even Barack Obama (allegedly! ).